In our article Solar Trackers we looked at how keeping PV solar panels facing directly into the sunshine all day greatly increases the total amount of electricity generated. Achieving this goal automatically requires a solar tracker – an electronic device which locates the direction of the sun and controls motors which turn the solar panel to face it. For large PV solar panel systems, the costs of a suitable electronic solar tracker are more than covered by the cost savings provided since less PV panels are required to generate the same amount of electricity. However, for small PV panels, it is usually not economically viable to fit a solar tracking system. In this article we will look at a very simple solar tracker system which can be put together as a DIY project very cheaply and easily. Rather than using light detecting components and other electronic circuitry, this solar tracker has no electronics at all. Instead, a small PV solar panel is used as both light sensor and motor driver powering a small low voltage DC motor directly. The small solar panel is fitted at 90 degrees to the west of the direction of the main solar panel. When the main solar panel (used to charge batteries or power something directly etc) is facing directly into the sun, the small solar panel will be exactly side on to the sunshine and so will be generating insufficient electricity to power the motor. As the sun moves from east to west across the sky, sunshine will start to hit the PV cells on the small solar panel sending power to the motor and rotating the whole assembly. After a small amount of rotation, the main panel will again be in direct sunlight and the small panel side on to the sun (stopping the motor and its rotation). Gearing is used to slow down the 100’s-1000’s of RPM of the motor so that it can rotate the solar panels in a controlled manner. At night and under heavy cloud, the small PV panel does not generate electricity and therefore does not power the motor. 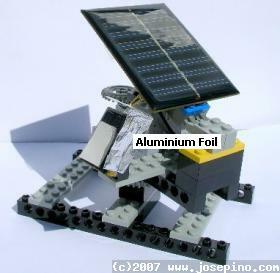 One of the cleverest parts of this concept is the use of aluminium foil to shield the small solar panel. 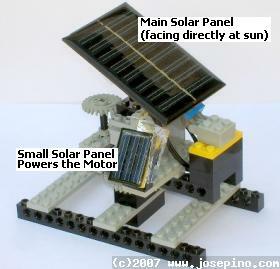 During the day it casts a shadow on the small solar panel when the main panel is in direct sunlight thereby ensuring the motor stops turning with the panels in the correct orientation. In the morning (when the main panel is still pointing to the West where the sun set the night before), the sun will rise in the East, reflect off the inside of the aluminium foil onto the small solar panel therefore generating the necessary power to re-orient the main panel toward the East to start a new day of solar tracking! Click here to view the full article about this Simple Solar Tracker on the excellent José Pino Projects and Tidbits website.